Last week I had the great opportunity to fly to the “Silicone Valley” region of California in San Jose, and join the Persian side of my family in celebrating the marriage of my little cousin Shayda to her (now) husband Brian O’Hara. Now I’m not sure how your family rolls, but with mine when we get together for anything you can bet your “ bottom-dollar” there’s going to be great food… and man-oh-man was there ever! So my last night in California was spent with family and great food, and a dish I have tried before on my own, but not had great success… the elusive and wonderful TACHIN! My best success in the kitchen, when it comes to new recipes, has always been observing how the “masters” do it and asking a whole bunch of questions along the way. Observe I did, and the explanations and answers I received were full of family stories and recommendations. Nothing better, in my opinion, to take back home, recreate, and add my own personal flair to show to you guys. Tachin at my cousin's home, baked on the stove top. So what is TACHIN? Basically, it is a baked rice dish of saffron and yogurt, layered with chicken, coming out golden and crispy on the outside while remaining soft and pillowy on the inside. Now what you do to your tachin as far as the layers are up to you. One of my favorite aunts back in Iran layers hers with Chicken and roasted or fried Eggplant. Layering chicken with tiny and tart barberries (or Zereshk in Farsi) is also popular. I wanted to do mine a little different yet keeping Persian flavors familiar in any Persian kitchen… so I chose caramelized shallots and tomato. On the outside looking at this recipe Tachin seems like a lot of work… but some of you know my theory about being in the kitchen. Great food takes time, but if you are serious about making good food and love being in the kitchen, then this recipe is a breeze. Prep all the components, turn on your favorite music, pour a glass of wine, and enjoy the experience. Kissing the beautiful bride! Cheers! And While you’re at it, if you could raise a glass to my cousins Shayda and Brian, and wish them well on their new journey in life together… they would greatly appreciate that. Thank-you and enjoy the Tachin! Nooshy-Joon! Caramelizing the shallots and adding tomato. 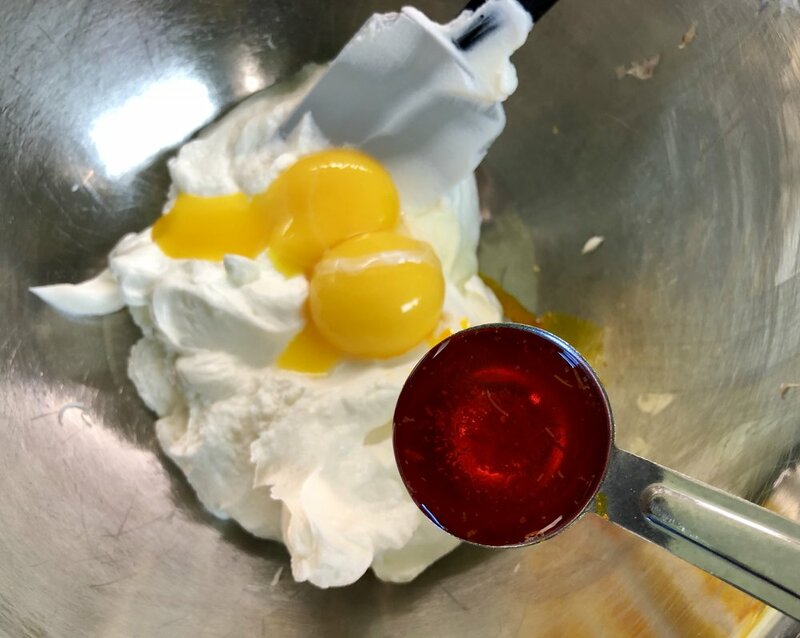 The yogurt and saffron mixture. The first layers of saffron rice and shallot-tomato. Begin by adding the rice to a mixing bowl and rinsing under cold water. Rinse and drain the water three or four times, or until the water runs clear. Finish by covering the rice with cold water and setting aside to soak. Next, add the dried saffron to a small bowl with a cup or two of boiling water. Set the saffron aside to steep in the hot water, releasing flavor and color. Next, add the chicken to a medium size pot. Add the sliced yellow onion and bay leaf. Cover in cold water, add a pinch or two of Cook’s Line Seasoning (or salt) and begin to heat on the stove top. Bring to a light simmer and simmer your chicken until it is fully cooked about 35 minutes. Drain (or reserve the stock for another use) and lay the chicken out on a plate to cool. When cool enough to handle, hand shred the chicken. Set aside. Partially cook your soaked rice. Add the rice and water to a large pot, and add more water if needed so that the water is at least 1/2” above the rice. Add salt for flavoring and cooking. Bring the rice to a boil and cook for 10 minutes,. The rice should not be fully cooked but al dente. Drain the rice and let it cool. In a mixing bowl add the yogurt. To that add the two egg yolks, a good pinch of Cook’s Line Seasoning (or salt and pepper), and three tablespoons of the saffron water. Mix to golden yellow goodness. Finally, as far as all the prep goes before building the tachin comes the next layer: In a sauté pan add a tablespoon of grapeseed oil. Heat gently and add the thinly sliced shallots, or thinly sliced yellow onion if you are substituting. Cook slowly to caramelize! The idea is not to brown the onions, but to cook slowly and caramelize the natural sugars found in the shallots. Cook slowly for 10-12 minutes until golden brown and tender. Add the 1/2 cups of tomato paste along with a tablespoon or town of the saffron water to “loosen up” the mixture, and to add flavor. The shallots and tomato need to be spreadable, like frosting. Add the cooked and cooled rice to your yogurt and saffron mixture. Add two tablespoons of grapeseed oil. Fold the rice into the yogurt mixture until fully incorporated, golden, and creamy! Okay, TIME TO BUILD YOUR TACHIN! In a small to medium, square or round, high sided baking dish, spray the inside bottom and sides with cooking spray. Add a layer of the yellow yogurt rice.. about an inch. You will need three layers of yogurt rice total, so portion out the rice accordingly. Smooth out to all sides and corners evenly. Next, add your tomato and shallot layer.. again spread out evenly with a spatula to the sides and corners. Add another layer of the yogurt rice on top of the tomato shallot. Then a layer of your shredded chicken, finally adding the last layer of yogurt rice which should hopefully be at the very top and flush with your baking dish. Cover the tachin with aluminum foil and place into a 375-degree oven. Bake for 45 minutes covered. Remove the foil and bake an additional 15 minutes to crisp up the top. Remove your tachin from the oven and let it rest for ten minutes. Run a sharp knife around the baking dish to loosen the sides. Now it is time for the “Flip”. Place a platter, larger than your baking dish, over the tachin. Carefully, while securing the platter over the baking dish, flip the baking dish over on top of the platter. Essentially the bottom of the tachin become the top, and center of the platter. Like an upside down cake! Slice the tachin as you would a cake or pie. Serve with a leafy green salad or even Salad Shirazi (click for recipe) … my favorite! 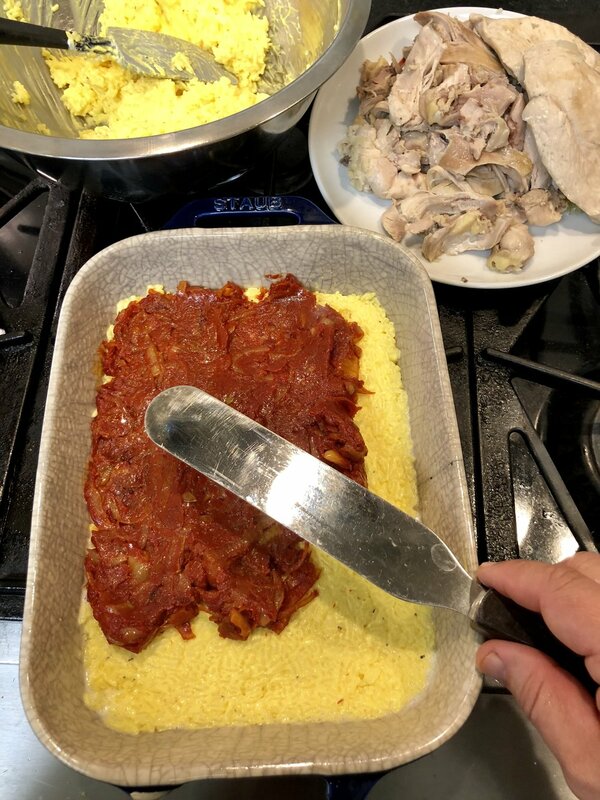 Once the final layer of chicken and saffron rice has been added, cover and bake... then FLIP!